Everyone knows that recycling is a great thing, but did you know that you can recycle your everyday household products to save money? You’re not just recycling, but reusing your old stuff. This includes fixing up old things, buying old things are garage sales, refinishing, restaining, and even finding new uses for old things. “Upcycling” is a term that gets a fair amount of mockery these days — it basically involves taking something old, like a sweater, and creating something new out of it, like a teddy bear or a pair of leg warmers. If you spend time on Etsy (or Regretsy), you’ll know that there is almost no stopping the “upcyling” trend, sometimes for the worse. 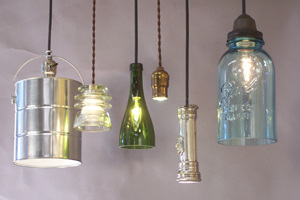 However, repurposing old goods can result in some stunning (and useful!) projects. Take this workspace created from old coffee tables. If you do have a knack for sewing, then you might find your calling in repurposed kids’ clothing or accessories for the home. The original repurposed project, the homemade t-shirt quilt, can be outsourced now, so even if you can’t sew worth a darn (heh), you can still find a comfy use for your old alma mater sweatshirts…. You can read the rest of 18 Ways to Make Old Things Seem New here. Here are some of our own tips on how to reuse things to save money. Plastic milk cartons make great garden tools. You can cut the top and bottom off and use them to cover and protect young plants in Spring. Old furniture can be refinished and either reused by you or sold for others to use. Use family heirlooms or outdated furniture for a different purpose. For example, my grandmothers vanity is now a dresser and suitcase holder in our guest bedroom. Old doors can be made into workbenches or coffee tables (if the wood is antique). Mason jars and other glassware can be used to help sort things in your craft room or workspace. Plastic bags from grocery stores and the like can be used as kitchen or other garbage bags. Coffee grounds make good additions to soil. They help acidify the soil and provide some nutrients and drainage. Old pillows can have the stuffing removed and used to make new pillows or art projects. Wooden crates can become cubbies. Old appliances can become planters. Colored bottles can become vases. Newspapers and cardboard can become landscape barriers. Food waste and other organic materials can be composted and save you money on potting soil. Almost any electronic product can be sold or recycled. For example, cell phones can be given to military families through the cell phones for soldiers program. Visit a site like Etsy.com to gets hundreds more ideas. As you can see our list is a decent way to get you started reusing old things, but the ways you can do it our endless. And it takes more creativity than I probably have. Basically, before you throw anything out, go do an internet search about how to reuse it and you can probably find several clever and creative things to do with it. Have any ideas of your own, please post them in our comments section below. I love articles like this. They inspire me! :o) You are I am in the reduction phase of the reduce, reuse, recycle/upcycle triangle. If I haven’t looked at or used any item in 6-12 months … it is up to be sold or recycled. I think that recycling and repurposing items is a great idea. It not only saves you money, but it helps the earth by keeping things out of the garbage dumps, that may mot decompose well. For instance, all the plastic bags we get at the grocery stores will take years and years to decompose. Reusing them in little wastebasket in the bathroom or bedroom is a great idea. Ven though they eventually still end up in the dumpster, at least the have done double duty first. So discovered that they are great when crocheted into small area rugs, and even for dog beds. I just add a yarn of a pretty color, and make them into a small rug, which can be washed, and lasts for a long time, and it is relaxing to make them. There are some great ideas for crocheting “plarn ” on the Internet, and tutorials on YouTube. Previous post: Should You Use an Online Budget Tool?